Mazel Tov, it’s a winemaking miracle. This year, you don’t have to drink Manischewitz at your Seder. 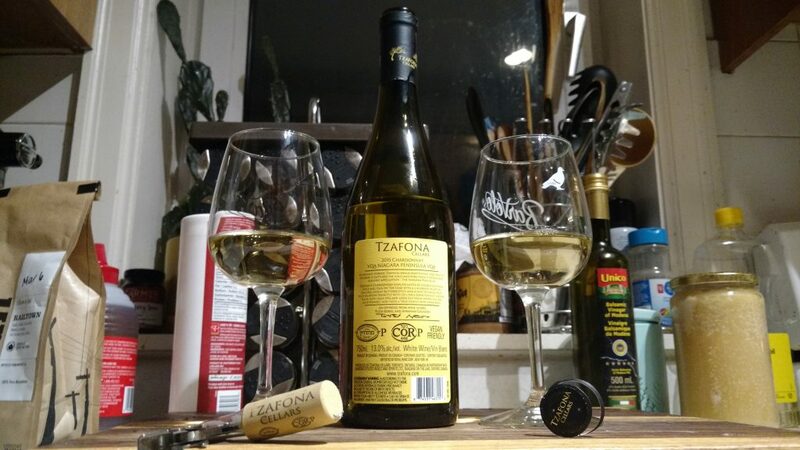 Locavores can sip and savour a Kosher for Passover Niagara Peninsula VQA wine, courtesy of Tzafona Cellars, based out of their parent winery, Diamond Estates Wines & Spirits in Niagara-on-the-Lake. Last year, we dropped the Kosher for Passover series, as we were not very successful in finding anything new to write about. 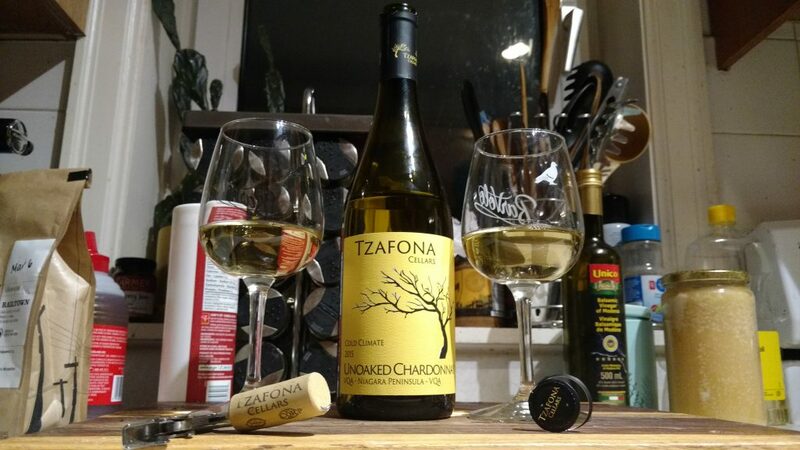 This year, I had the chance to catch up with Rabbi Avraham Gislason, and chat a bit about his pride and joy, the Cold Climate 2015 Unoaked Chardonnay, which I picked up for $22.95 at the well-stoked Kosher section of the LCBO on Wilson Ave. He was sampling the Cabernet Sauvignon and the Vidal Icewine when I popped in. Since I don’t really dig sweet wines, I snagged a bottle of the Cab Sauv and put my faith in the Unoaked Chardonnay. The 750 ml bottle clocks in at a very Passover-friendly 13% ABV. Seders are long. Stock up. Drink up. 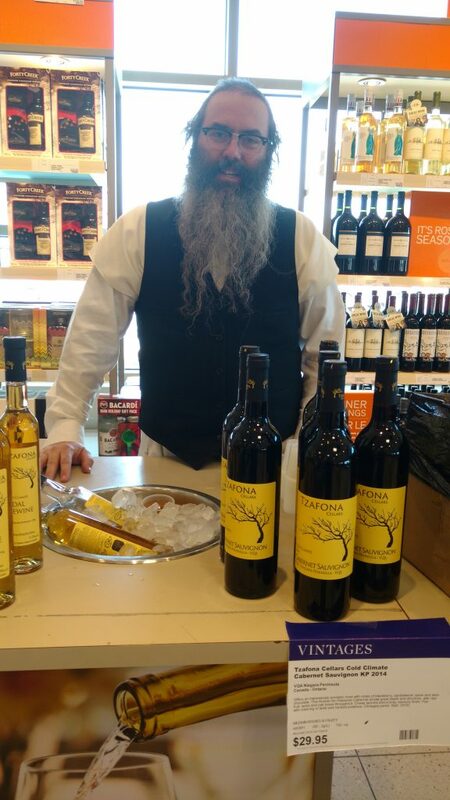 Rabbi Gislason (or Avi, if you’re casually sipping wine in the liquor store like you belong), is the brains, winemaker, and rabbinical supervision that makes Tzafona Cellars Kosher for Passover, and vegan-friendly to boot. Now not all wines are vegan by default, as the clarifying process (called fining) in winemaking relies on a few compounds that are of animal origin, such as eggs, gelatin, casein (a dairy compound), or even isinglass (a fish bladder protein). Now for a wine to be considered kosher, the fining agent needs to be considered kosher and a Sabbath-observing Jew needs to supervise the entire winemaking process. So now you have something suitable for your gluten-free vegan Jewish cousin Frieda to imbibe in during your Seder on the weekend. I’m going to dispel a few myths about Kosher wine. Are you ready? Kosher wine doesn’t have to be sweet. Manischewitz is made from Concord grapes, which are not vitis vinifera grapes – they are vitis labrusca grapes. All your Old World wine varietals will be vitis vinifera. Know what Concord grapes are good for? Grape jelly. Welsh’s grape jelly is made with Concord grapes, people. Kosher wine shouldn’t cost you $7.25 a bottle. No wine should cost you $7.25 a bottle, and yet Manischewitz retails for that price at the LCBO. Many familiar wine regions have Kosher offerings. You like a bold Bordeaux, or a passionfruit scented New Zealand Sauvignon Blanc? Maybe some Prosecco? There are lots of Kosher options out there for you to bring to Bubby and Zaida’s house this year. Kosher wine can still taste good. I know. This one did. Have I mentioned my dislike of Manischewitz? No? I’d happily sip this cold climate Chardonnay year round, although it is a couple of dollars out of my weekday budget for wine. 2015 brought the Niagara Peninsula a cold and dry winter, with excellent growing conditions during the summer growing season. Aroma: Yellow delicious apples, unripe strawberry, Anjou pears. Really stick your shnozz in the glass and get a whiff at the start of your Seder, bubeleh. Melon. Palate: Ripe peaches, lemon, limes, fresh apricot and nectarines. The bottle is labeled as unoacked, but I got some hallmarks of oak contact from some butterscotch and toasty notes on the mid palate. Possible presence of large, older barrels? Suggested food pairings: Fruit salad, an Israeli salad of cucumbers and tomatoes, fried matzos, and guilt over not having a traditional Jewish wedding. Oy vey. Overall, this wine is quite true to the Ontario cold climate terroir of Chardonnay and hits all of the notes a bottle of Chardonnay should. L’Chaim!